floral smell with a touch of citrus to it ...a seductive floral note -sweet-rich and warm ! NO fake,synthetic scent here ! 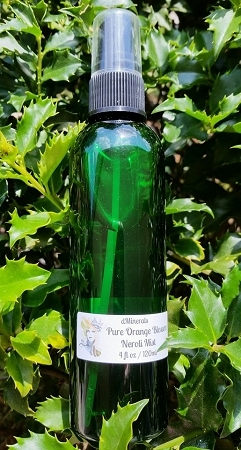 Our precious Orange Blossom Neroli Spray Mist comes right from the plant ! Neroli is very high priced and we do our best to offer it at the best price possible and the best quality. Many say they use it for anxiety and depression...also to lift their mood ! Spray on your pillow at night for a relaxing scent. Neroli was named after Anna Marie Orsini...The Princess of Nerola, Italy in the 17th century, she would scent her gloves with it ! It is also used for toning & hydrating the skin ! It has some beautiful aromatherapy benefits with it's gentle & irresistible sweet orange blossom scent.! Some moms have said they spray the orange blossom neroli mist on a damp cloth and wipe their child's face to calm them when throwing fits and having anxiety & others have said they us it to help focus by spraying on the body and in the air...Others have even told me when they get the jitters thy spray on the body and in the air for a calming effect ! It is a romantic scent for some ! Moms love it as a spray & wipe for baby's bottom ! I have also been told by some that they apply it to their abdomen area to relieve bloating and gas...I just love nature...It really is amazing ! It is a great gender neutral scent so it can be enjoyed by men and women ! The orange flowers are said to signify love-courage & joy. Try using some in the air and bath to drift off to sleep. Nobility is said to have scented their linens with it ! ...you can keep it in the fridge if you like ! It is also said to be used in a secret recipe by Coca Cola ! Distillates are also referred to as Hydrosols and Floral Waters...They are a byproduct of distillation in the making of essential oils giving us valuable plant compounds left behind from distillation..